PT Bank Syariah Mandiri - BSM or more popularly called as "Mandiri Syariah" is a well-established financial services company in Indonesia with core business competencies in sharia banking industry. Mandiri Syariah is a member of PT Bank Mandiri (Persero) Tbk. At present, PT Bank Mandiri (Persero) Tbk - the largest state-owned banks in Indonesia - hold 99.999999% shares in PT Bank Syariah Mandiri and the rest is owned by PT Mandiri Sekuritas. Mandiri Syariah has 3 main products/services ; financing product, funding product, and product services. Based in Jakarta, Mandiri Syariah offer services through more than 765 office networks and directly employs more than 15,659 employees (as of December 2017). Mandiri Syariah also supported by more than 287,113 ATMs networks (BSM, Bank Mandiri, ATM Bersama, ATM Prima, MEPS). According to information found in PT Bank Syariah Mandiri Annual Report 2017 as cited by JobsCDC.com. Mandiri Syariah generally recorded a good performance in 2016. Mandiri Syariah booked total assets of Rp 87,940 billion in 2017. This total assets reflected an 11.55% increase from Rp 78,832 billion in 2016. Referring to its annual report, Mandiri Syariah reported total net profit of Rp 365 billion in 2017 or up 12.31% from Rp 324 billion in 2016. Maximum age of 27 years old (Fresh Graduate) or maximum age of 32 years old (for those who have experience in banking / micro finance institution). Minimum D3 in any field with minimum GPA of 2.75 for RSE, CM, SFE and minimum SMA for SF. Possess own vehicle (motor cycle) and SIM C.
Able to read Al Qur'an. Placement in BSM KCP Ungaran (preferably domiciled in Ungaran and its surrounding area). JobsCDC.com now available on android device. Download now on Google Play here. Please be aware of recruitment fraud. The entire stage of this selection process is free of charge. 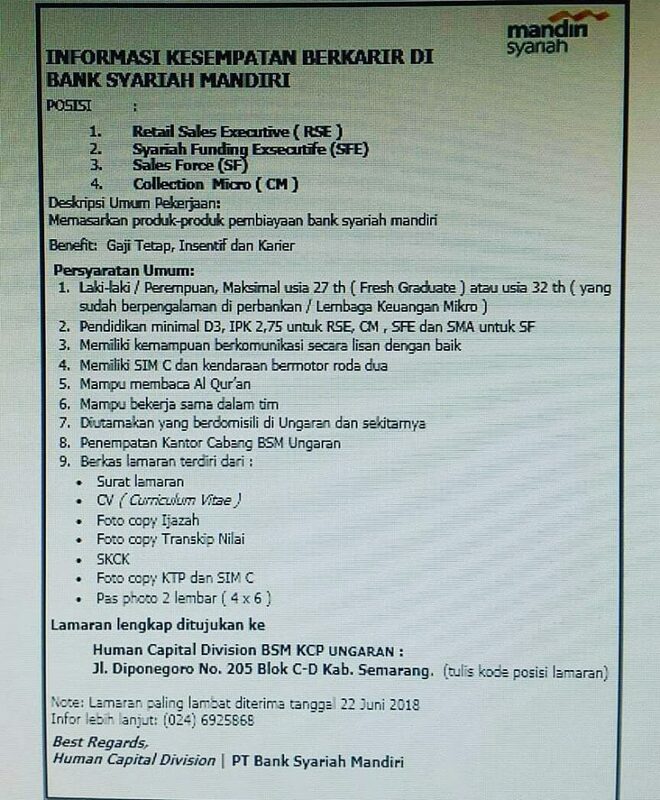 PT Bank Syariah Mandiri - SMA, D3 Fresh Graduate, Experienced Mandiri Syariah June 2018 will never ask for fees or upfront payments for any purposes during the recruitment process such as transportation and accommodation.